Wetland maps are a prerequisite for wetland inventory and for wetland development planning, management, protection, and restoration. Maps provide information on wetland type, location, and size. These maps are used by local, State, and Federal agencies, as well as by private industry and organizations. They are used for many purposes, including the development of comprehensive resource management plans, environmental impact assessments, proposed construction buffers, natural resource inventories, habitat surveys, and the analysis of trends in wetland status. The boundary of the wetlands is determined by a trained biologist observing the soil types, vegetation, hydrologic indicators, and reasonable scientific judgment. Typically numbered blue or pink colored flags are then placed in key locations to denote the boundary of the wetlands. These flags are then roughly mapped by the biologist. He then provides the surveyor with this rough map including number of flags and high water marks shown. The surveyor then accurately locates the before mentioned flags and marks. 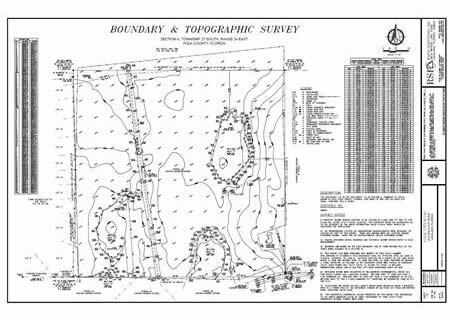 The surveyor draws a map to reference the boundary of the surrounding plots or parcels of land. A chart is added to the drawing providing flag numbers and state plane coordinates for future reference. Rapid Surveying has surveyed and mapped many wetland locations in central Florida. We have worked with local biologists and wetland agencies. We uphold the standards of the different agencies that require wetland surveys.